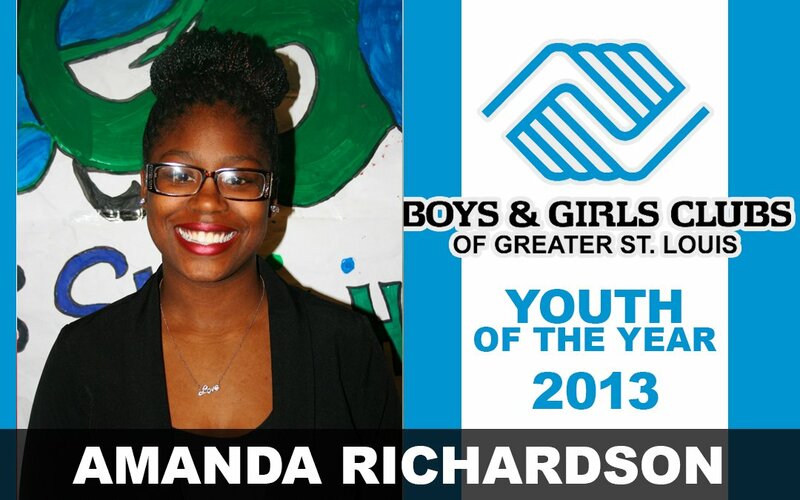 Amanda Richardson has been a member of Boys & Girls Clubs of Greater St. Louis – Herbert Hoover Club for 3 years. A senior at Beaumont Career and Technical Educational High School, her first semester grades put her on Platinum Honor Roll with a GPA of 3.6. Amanda’s favorite class is writing, which is taught by Mrs. Tillman who inspires her students to write from their own personal experiences. Amanda enjoys writing because it gives her the opportunity to express her feelings and thoughts. She is currently enrolled in a culinary class that is preparing her to reach her goal of becoming a “Top Chef.” Currently, Amanda is interning at Lester’s – a popular St. Louis restaurant. Amanda is very passionate about learning to cook healthy meals and intends to add that skill to her resume. In the fall of 2013 Amanda will attend Dillard University in Louisiana, where she will study and earn a dual degree in Social Work and Culinary Art. At the Club, Amanda serves as treasurer of the Keystone Club and is responsible for the tracking of daily earnings and expenses from the Keystone Concession Stand. Amanda takes this responsibility very seriously because she knows that her peers and staff are placing great trust in her. She is currently working with fellow Keystone members to raise money for traveling expenses to Atlanta for the 2013 National Keystone Conference. Amanda has participated in SMART Girls activities since joining the Club because she felt it was a wonderful opportunity for her to share her story with her peers and give them healthy advice. Amanda wants her peers in SMART Girls to be positive leaders and role models for younger female members of the organization. “The Herbert Hoover Club is a place I call home,” explains Amanda. “It is a place to get away from all the harmful things that surround me in my community. Any day I’m not at the Club I know that I can potentially face gun violence, drug deals, robberies, and even death.” Consequently, Amanda considers the Club her home away from home.